We can custom install beautiful hearty shrubs and vibrantly colorful perenials that will make a huge statement. We purchase only the best quality plants from local suppliers. This ensures a lush and vibrant look and plants with great, lasting health. Let us make your house come to life today! Christensen Landscaping can install beautiful rock and stone features to your home. Whether it is a retaining wall with elegant stone faced block or the natural look of boulders, we can make it happen. Also experts at paver patios and walkways we can make your guests awe at your entertainment patio or stop and stare as they enter your home. The sky is the limit on how beautifully elegant you can make your home! We install sod of a quality blend of kentucky blue grasses that will make all of your neighbors envy your yard. We are full service installation, this includes delivery, grading, and the laying of the sod. Christensen Landscaping was one of two companies in 1987 to introduce big roll sod to Minnesota. The rolls are 30" wide and 150' long, this allows for efficiency and a better quality. 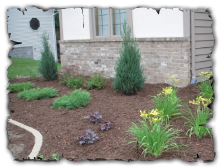 Christensen Landscaping is known for its amazing grading work. Quality grading makes a big difference in the look and feel of your yard. We can grade your yard and install sod for you or we can also grade your yard and allow you to install your own sod. With our quality your yard will look stunning!